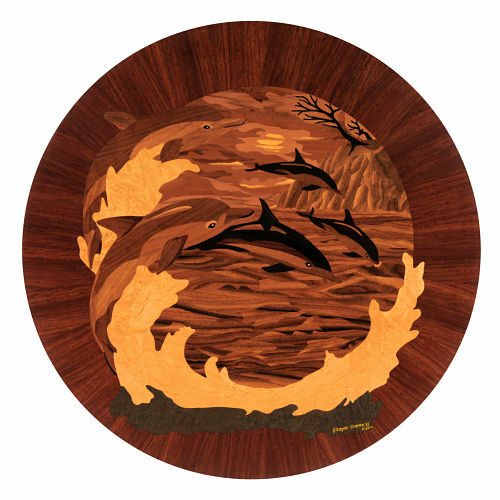 Enjoy the exquisite marquetry work of this talented featured artist, and see more of his work by visiting his website. My name is Grzegorz Czarnecki. Currently I reside in Maspeth, New York, but originally I am from Poland. Ever since my youth, I have had a profound interest in carpentry. The job of designing and creating all sorts of finished products from wood gave me a feeling of great satisfaction and fascination. When I was 15, I first encountered the style of marquetry. My love for that form of art and, what I quickly discovered, great skill in the field that I had, opened up a whole new world to me, one which I knew I had to explore. Marquetry, or wood decorative artistry, is considered to be one of the most difficult arts. Besides unrepeatable skills, it requires patience, engagement, and unprecedented precision. A beautiful item of marquetry is the fruit of a long and detailed process of picking, cutting, placing, and gluing which takes a long time. A real artist is able to combine factors such as grain, color and texture of materials to render desired aesthetic results as he would be using a palette to paint paintings. The motifs applied in intarsia include elements of landscape, animals, flowers, people and geometrical details. I carefully choose the right wood, the right grain for each and every piece that goes into a final panel. The direction and type of grain can express motion, emotion and form, so it is crucial to choose every single piece (and a single work can have over a thousand pieces… hundreds of individual pieces of wood hand cut and held together to form a final piece) with the final objective clearly in mind. It can make a huge difference in the outcome if this is done successfully. It is hard to put your inspiration into words. Ideas come from everywhere: dreams, words, world events, a shape in nature, an emotion that seems important enough to express in form. I have a special passion for marquetry and anything to do with wood. There are so many wonderful species of wood in many colors and grain patterns which makes marquetry so satisfying. I get to see and use several of these different colors and textures in a single piece of marquetry, like oil painting that flourished during the Renaissance. Marquetry is my way of appreciating the beauty of wood and expressing my creativity and my passion. I love being able to spend my time doing something I truly enjoy. My works are variously defined. Some people say it’s a craft, and they pass by indifferently. For others it is a real art. They stop, watch, and share their expertise. It is difficult to introduce art marquetry through photography. Photographed marquetry does not fully reflect the mood and impressions of the art piece. The art lives its own life, depending on time of day, and angle of light.